Enjoy the great outdoors and liven up any backyard barbeque, outdoor church game, boy scout outing, or family game night with the Out! 25 ft Tug-of-War Rope. 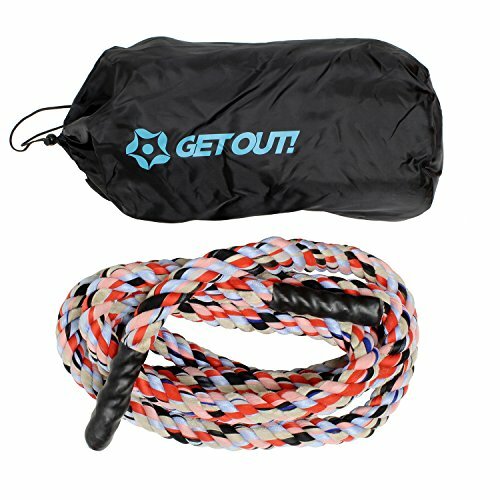 This rope allows you to get the most out of your workout while ultimately having fun. To play, evenly distribute the weight and strength of both teams on each side of the rope, pick-up the rope and pull towards you. The first team to pull the other team across to their side wins. Tug of war helps children develop gross motor skills, but this rope is also great for adults who want to perform any other workout routine. The 1.5-inch diameter rope is burned on both ends and includes waterproof heat shrink end cap sleeves that protect against friction and frays. A carrying bag is included. Every rope is handmade and uniquely colored -- photographs may not reflect the color of your rope. EASY STORAGE: Heavy-duty nylon drawstring carrying bag is included for easy transportation, safe storage, and quick organization - each rope is handmade and a surprise of color!